Knife Edge is a film that there isn’t particularly much to say about. I could waffle on for hours talking about the “complex” mystery plot, or the oddly inserted side storylines, but that would be spoiling it and like the film itself would be rather boring. See, Knife Edge isn’t a very good film, but it’s not a horribly awful one either. It’s just substandard in every way, featuring nothing that hits one extreme or the other, apart from the acting, which slides to the unfortunate end of the scale. The end result is a run of the mill mystery, horror, haunted house film that is only really noticeable by how unnoticeable it is. Natalie Press plays Emma, a stockbroker living in New York who returns home to England to start a new life with her French husband Henri (Matthieu Boujenah) and their kid in a massive isolated mansion in the country. As expected, something is amiss and Emma begins having vision of terrible things being committed there, and their son has a very creepy relationship with a new toy he finds in the house. Basically it’s a bunch of horror clichés mashed together complete with passing visual nods to The Shining (just you know, not good). Towards the end multiple twists and turns are made to try make some more excitement out of the rather static first half. The first half devotes a lot of time to the mystery of the house, but only divulging things very slowly. It would be effective if during this half there were some intriguing scares, but they all come off rather half baked. It doesn’t help that the film looks like a made for television movie that was due for release fifteen years ago either. The direction is competent but the film as a whole isn’t particularly aesthetically pleasing. 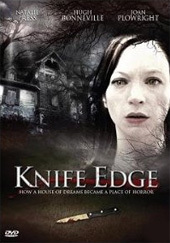 Knife Edge really isn’t helped by its lead performances, which are rather woeful across the board. Natalie Press seems like every action she makes in the film is laboured, and makes her dialogue sound like she isn’t familiar with the English language. Poor Matthieu Boujenah also suffers, as his natural French accent makes much of his delivery sound unintentionally hilarious in what is meant to be an unsettling film. Making matters worse Boujenah isn’t doing a world class job either, which means the two characters the viewer is supposed to be invested in are hard to watch. Overall there isn’t much to recommend about Knife Edge. It is not a film that needs to be dragged through the mud, and it isn’t one that can be laughed at for its comical poorness. Instead it is just forgettable, in fact it would be completely forgotten if it wasn’t for two rather horrible lead performances. It’s not really worth a watch, unless you are an obsessive horror movie fan and must see everything that comes out. Even then it isn’t really worth the money.